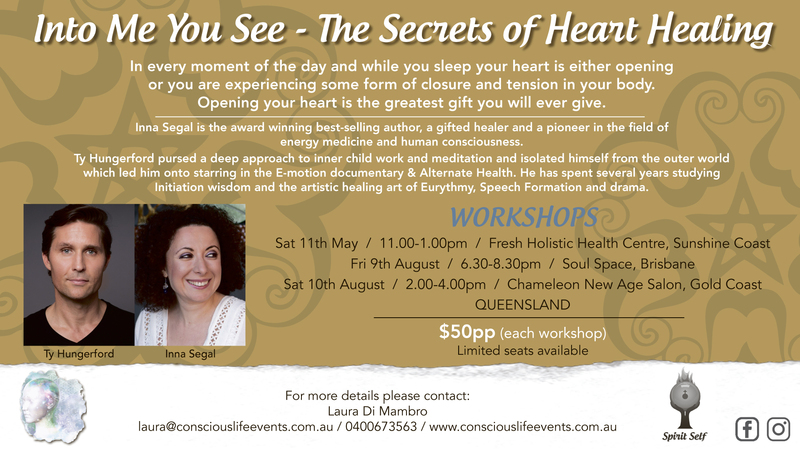 Inna Segal is an internationally recognized healer, professional speaker and author. Her work is supported by medical doctors and natural health practitioners from virtually every modality. 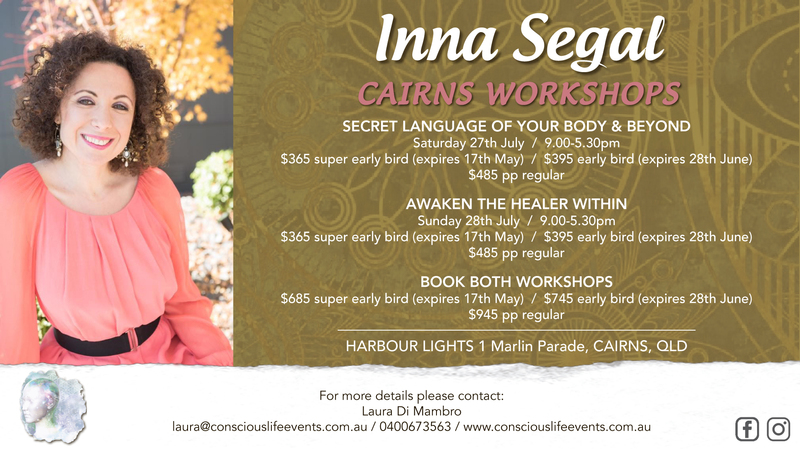 Inna is a gifted healer and a pioneer in the field of energy medicine and human consciousness. She can “see” illness and blocks in a person’s body by intuitive means, explain what is occurring, and guide people through self-healing processes..
‘Inna Segal is a true genius when it comes to looking at emotions, and her book “The Secret Language of Your Body” is an amazing resource I use time and time again”. – Tyler Tolman is a world-renowned speaker, and one of the world’s leading authorities on natural health and longevity. n every moment of the day and while you sleep your heart is either opening or you are experiencing some form of closure and tension in your body. Opening your heart is the greatest gift you will ever give. The feminine in you wants nothing more then to be seen! This means you need the courage to be open and trust, even though you have been hurt so many times before. How can we understand wholeness if we haven’t fathomed the depth of our soul life? Only through an open, sensitive heart can you discover who you are and access your inner sensibilities, without the masks that you took on from your childhood. Understand more about your soul group and why you have chosen your particular family to learn and grow from. You will always be partly a victim of life’s circumstances if you have not taken the time to educate yourself in the real laws of karma. Karmatic knowledge frees us to open up into all that we are and creates a real paradigm shift from which one can live. It is the true journey of healing. Inna and Ty’s last two weekend workshops have been the catalyst for so many powerful transformations that they have decided to teach together. It is such a rarity to find teachers who will safely enable you to feel the depths of your soul feelings and purify your spirit with knowledge of higher worlds. What if understanding this hidden language meant a choice between living your life – fully, consciously and powerfully or being a victim of dis-ease, struggle and frustration? • Understand the impact your ancestral memories have on your body and life. 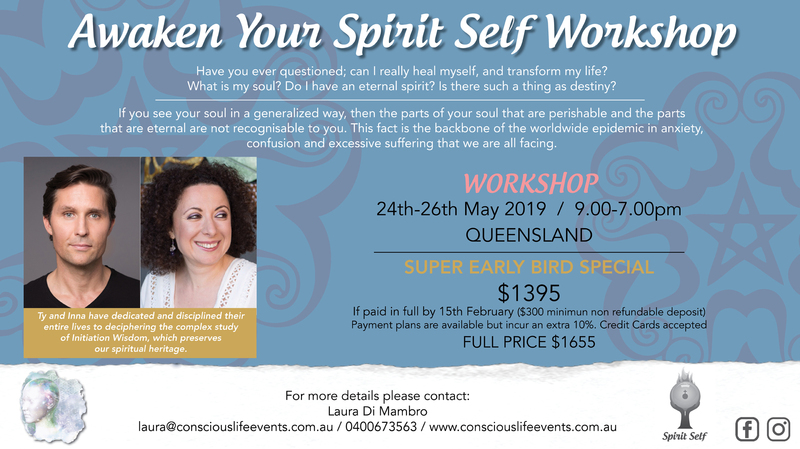 • Work with profound processes to refine your Astral body. • Discover the importance of being incarnated in your body and the role of your Ego body or “I”. • Experience a rare opportunity to ask Inna questions. Ty and Inna have dedicated and disciplined their entire lives to deciphering the complex study of Initiation Wisdom, which has been the positive leading world impulses behind all civilizations, myths, fairy tales, legends, religions and folk poetry. Is your house forever? No! Your car? No! Bank account? No! Physical Body? NO!!! The only thing that is forever is your relationships to other souls and how that weaves into the Spiritual world. In this material age, we don’t even realise how caught up we’ve become in the transient areas of ‘ outer success and our outer image, yet it never brings us any deep self-worth or security. What if we had the courage to enter into understanding and exploring true IN TO ME YOU SEE-INTIMACY? Inna: – After twenty years of experience, I truly believe that to be whole we have to go to the depth of Soul Healing, whilst encompassing the eternal world of the spirit. 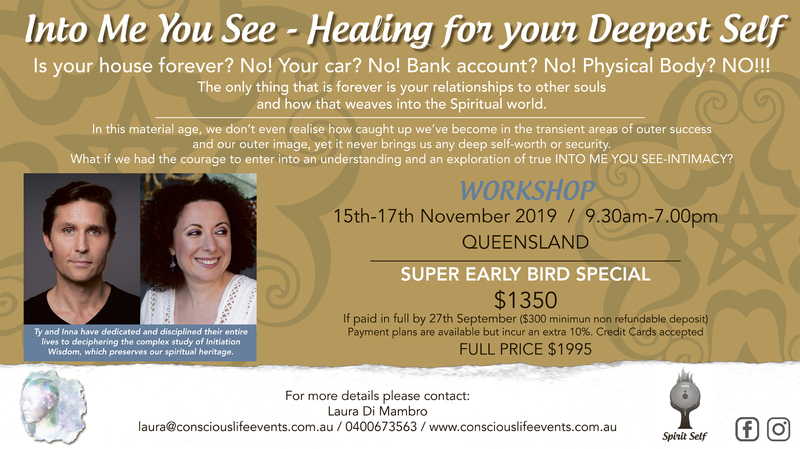 The uniqueness of this workshop is that I can take you to the depth of your soul, whilst Ty can help you to reach your Spirit. This life changing 3 day immersion will gift you Inna’s most powerful take home processes along with the highest forms of spiritual movement practices. You will be gifted pre-training videos with processes prior to the workshop to help your soul prepare for transformation. Transform your experience of suffering pain and darkness into an evolutionary understanding of our Earth-Humanity. We, the event organiser and presenter have the right to make any changes to the content of the events if we feel that it is of the best interest of the group/ attendees . Inna always tunes into the energy of the group they works with and shares what is the most important for the people present to understand in order to heal. Thus, certain aspects of the workshop may change.